Billy Martin was twelve years old when he met legendary showman James M. Cole in 1972 when Cole's indoor circus performed at Billy's hometown school in Olean, NY. Billy's fascination with the circus evolved into a wonderful friendship with Cole, and at age 14, he began booking many schools for the circus throughout Western New York. After graduating high school in 1977, it was only logical he join the Cole Circus. 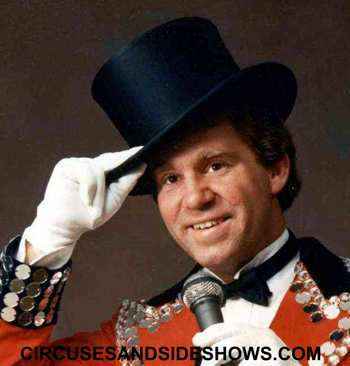 He performed a juggling/balancing act, served as ringmaster, and became Mr. Cole's right hand man. When Mr. Cole retired at the age of 80, Billy took over the show and remains at its helm today. With the ever-present support of his wife Angela, an accomplished aerialist and consummate circus performer, Billy continues the rich, grand legacy of the Cole All-Star Circus, performing to yet another generation. The Martins are proud of their heritage and the impeccable reputation of the Cole Circus in providing only the finest in family entertainment- Enjoy the tradition!